James Webber spared no expense in building his villa on the island of La Maddalena. It stands in stark contrast to the modest cottage he built at Tocal in 1822. Above: Villa Webber set in its rocky surrounds. Below right: side view of the Villa (photos: Cameron Archer). James Webber decided to settle permanently on La Maddalena. In 1855 he began to construct a mansion called Villa Webber. 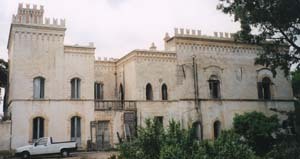 It was completed in 1857 and became known as one of the finest in Sardinia. 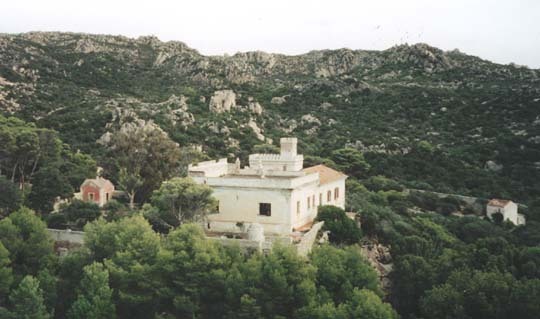 The two storey villa was built in a Moorish-Italian style, located in a natural amphitheatre of hills overlooking the beautiful coastline of La Maddalena. The ground floor of the villa contained a summer dining room, kitchen and servants’ quarters while upstairs were the bedrooms, library and a dining room in which hung 24 paintings, mostly of the Flemish school. The villa was constructed like a fortress, surrounded by three sets of massive stone walls, some of which are seven metres high. The walls formed courtyards containing extensive gardens, and the villa was surrounded by a vast pine forest planted by Webber at about the same time the villa was built. 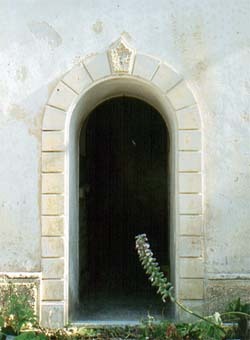 Right: although in need of repair, this entry door indicates some of the villa's past splendour. (Photo: Ms Valentina Susini). Villa Webber remained in the family until late in the 20th century but was in a poor state of repair following World War II. From 3 to 27 August 1943, deposed Italian leader Benito Mussolini was imprisoned in Villa Webber before being transferred to central Italy.